Shadow of the Colossus On PS4 Is Same As PS2 Version | Nerd Much? And it certainly shows. If you’ve ever studied Wander’s (the main character) run and walk cycle, you would have noticed the odd jerky motions in the animation. I find especially the run cycle is missing an essential lesson in human anatomy. In the new trailer of the PS4 version, the improvement and change to Wander’s character animation is the first thing I noticed. Gone are pointed toes and oddly straight legged run, in are the far more natural motions of running and walking. It’s not just the animation either. Yoshida also mentioned that they will be updating the controls as well, modernizing them for player’s preferences today. 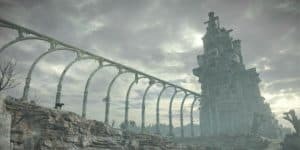 The idea, as Yoshida states, is so that Shadow of the Colossus is updated using today’s technology and shown as the truly great game that it is. Good news, for both new comers to the game, and old fans. This update certainly makes the game more accessible to new PS4 owners, as the console functions are great more favorably than the PS3 in many respects. I cannot being to praise how nice it is to stop mid-cut scene and watch Netflix for a bit if I want to. What do you think of Sony updating Shadow of the Colossus? Have you noticed any significant differences in the trailer? Let us know in the comments below!